On the scorched and polluted Earth of the 25th century, three young scientists and their hyper-intelligent talking chimpanzee roam the land in Ark II, a sophisticated mobile lab and research centre, to help rebuild and restore civilization. 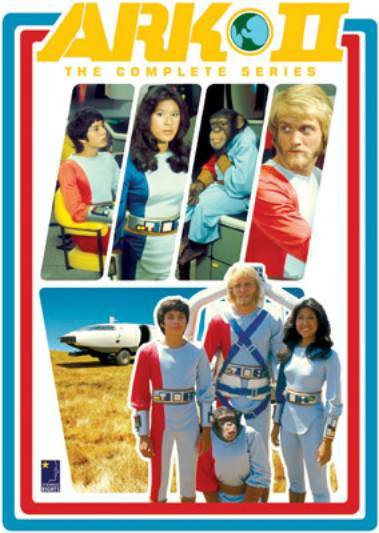 Led by Jonah (played by the late Terry Lester), every week he and his crew — Ruth (Jean Marie Hon), Samuel (Jose Flores) and Adam (Moochie the chimp) – would help villagers and farmers fend off environmental scourges, scavengers, crazy computers or immortal demagogues in a non-violent manner. It was Saturday mornings, after all. In fact Ark II was the most expensive live-action Saturday morning kids’ show of its time. Produced by Filmation, it premiered in September 1976, and although only 15 episodes were produced, remained on the air until 1979. It featured some great guest stars – Jonathan Harris, Malachi Throne, Del Munroe, a very young Helen Hunt, Jim Backus and Robbie the Robot (uncredited, alas) – as well as some very cool vehicles. It wasn’t as cheesy as it sounds, although the production values are sometimes lacking (each episode was shot in only three days). Each episode contained a “message,” but viewers were never slammed over the head with it and the show never sank to the level of cliché. They even went out of their way to avoid the obvious cliché – Adam the chimp is never played for comedy relief; he was an equal member of the crew. Even if he was wearing a diaper under his costume. The show was shot on 16mm film, so it’s never going to look great. That said, the newly remastered DVD release makes the series look pretty good. And for a 30 year-old series that only filmed 15 episodes, there’s a wealth of behind-the-scenes material: two episode commentaries, a new “making of” documentary, plus assorted photo and art galleries. But wait – there’s more! Also included is DVD-Rom material, including all the shooting scripts, plus the series bible. Many of the Filmation live-action Saturday morning shows are due to be released on DVD in 2007. Can a review of Jason of Star Command be far behind?